Similar to a family with a newborn, helping with simple tasks around the house can help a family who is down a member due to bed rest. You don't have to deep clean her bathroom (though that would be nice), even throwing in a load of laundry or transferring it from the washer to the dryer was helpful. I wasn't able to physically able to do much with laundry other than fold it, so I really appreciated the friends who didn't mind helping out. I will always remember the friend who came over and threw in a load of baby clothes: not only did it help me get a chore done, but I got to follow my nesting instinct and ooh and ahh over the tiny baby clothes. After a long pregnancy of uncertainty, it was nice to do something for the baby that made me excited and happy. I've always wanted to learn how to crochet and a good friend gave me a skein of yarn and some knitting needles late in my pregnancy. My goal was to watch YouTube videos and teach myself, but I ended up having the baby before I got the chance. Crocheting is still on my list of skills I want to learn. Another friend gave me a stack of vintage Mothering magazines and I devoured them! I've always been a voracious reader, but the pieces on natural birth, breastfeeding, and gentle parenting came at the best time for me. I couldn't put them down! They also helped me mentally prepare for life with baby. For me, bed rest was anything but relaxing. Yes, I was laying down all the time, but I was in a perpetual state of hyper vigilance. Every twinge and ache made me think it was preterm labor (I was right for a handful of those times). I was so focused on the baby and keeping my mind occupied that I wasn’t doing much for me. Self-care can be as simple as a journal with letters to baby or tracks designed to help baby stay in to a full at-home day at the spa! Coloring books and good quality markers were a much-appreciated gift. They were also a great way for me to spend time with my oldest. He still remembers coloring together while I was in bed. One thing I wish our friends had done was to help with our older son. By the time my husband was done working, cooking, and cleaning, he was exhausted. He still had to help our then-toddler with his bath, keep him entertained, and more. I know the poor guy could’ve used a break. If you’re comfortable with it, ask if you can watch the older child/children. Set up a play date in your home for the afternoon, take the future big brother or sister out to the park, or just keep them entertained in their own home. This was a HUGE one for me. My dear friend Erika, due a few weeks before me, would stop by one of my favorite restaurants to pick up lunch for us. She’d bring it to my house and spend her lunch hour with me. She did this a couple of times while I was on bed rest and it was so appreciated especially because she worked full time and was mom to a toddler when not at her job. I understand that time is precious; as mothers and women, our to do list is endless. The time Erika and other friends spent with me meant more than anything. If your mama friend on bed rest doesn’t live close by, schedule a weekly phone or FaceTime/Skype date with her. Stay connected, ask her how she’s doing, and let her know you're there for her. Need to send a care package? If your mama friend on bed rest lives far from you, consider sending a care package of goodies so she knows you’re thinking about her. Here are a few suggestions on what to include. And set up that FaceTime date, would ya? A pregnancy-friendly facemask, foot scrub, or other beauty indulgence that she can use while lying down. If she’s on hospital bed rest, send her toothpaste, lip balm, deodorant wipes, and dry shampoo. Being on bed rest was hard for me physically and emotionally. I learned I was more of a control freak than I realized. Having to rely on other people to do simple chores was a tough for me to do. Thankfully the people in my life knew how to help me without making a huge deal of it. The friends that stepped in and helped out my family during this tough time will forever have a place in my heart. Got any tips to support a mom on bed rest? Share them in the comments! 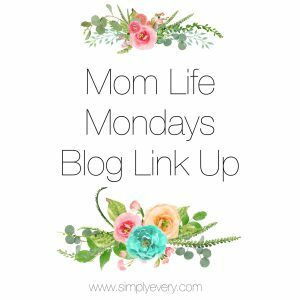 Thanks to Simply Every for hosting the Mom Life Mondays Blog Link Up!